Cake truffles. I’ve stayed away from these for a little while just because anything bite-sized is pretty labor intensive. Props to those who have the patience to put these together! I decided to try them to bring to a baby shower since they were individual servings and easy to transport. There aren’t too many photos of the process- my hands were usually covered in cake or chocolate ganache, but I was happy with the result. There were two flavors: Chocolate-Peanut Butter Truffles (inspired by mini Reese’s cups) and a Raspberry White Chocolate Truffle (Raspberry is always a favorite of mine). I topped the Chocolate PB ones with cut up pieces of the mini Reese’s cups, and the Raspberry ones with sprinkles. Here’s a general recipe that I used. I improvised a little, knowing the basic theory behind cake truffles. Instead of using frosting as the binder, I used ganache for the PB ones and a Raspberry Jam for the Raspberry ones. I used ganache for the coating instead of white chocolate or dark chocolate, which would have hardened a little more into a candy shell. I think some of my tweaks were made mostly out of laziness, but it tasted pretty good when all was said and done :). Microwave the heavy cream for 30-45 seconds until hot. Add semi-sweet chocolate chips. Let this sit for a minute or two while the cream melts the chocolate chips. Whisk together until smooth. Whisk in the peanut butter a little at a time, making sure the ganache doesn’t seize. Crumble up the cake into fine crumbs. Pour a little of the ganache into the mixture until the cake crumbs come together and can form a ball. You don’t want this to become too mushy, so work a little ganache in at a time. Reserve at least half of the ganache for coating the truffles. 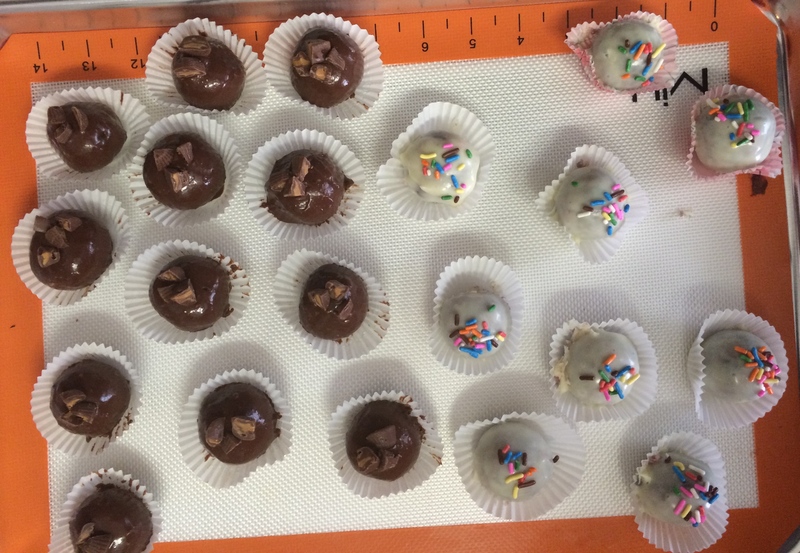 Form 12-15 cake balls. Put in the freezer to cool down. In the meantime, cool the ganache in the fridge. 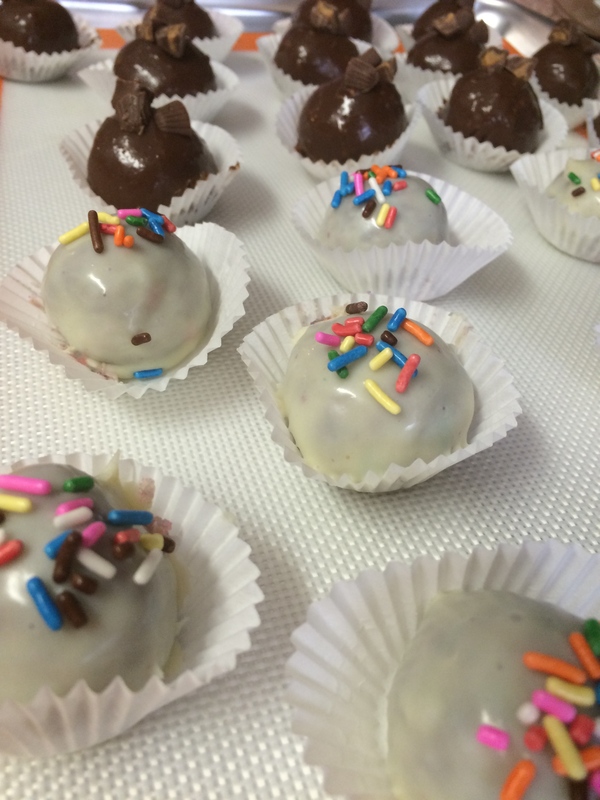 The consistency should be runny enough to cover a cake ball and coat it evenly. Coat the balls and place on parchment or wax paper (something non-stick). I used two forks and the “dunk” method- I placed a cake ball in the middle of the ganache bowl, rolled it around, and lifted it with a fork, sliding it onto a cookie sheet. When done, place these back in the fridge or freezer to harden. I used mini cupcake liners for each cake truffle when I was done. Follow the same directions as above, but instead of using the ganache inside the cake truffle, use the Raspberry Jam as needed to get the right consistency.